Stamping Lane: It's Here! The Biggest "Sale-a-Bration" of the Year! It's Here! The Biggest "Sale-a-Bration" of the Year! Sale-a-Bration begins today and runs through March 22. It's a FANTASTIC time to get some wonderful items absolutely FREE! Woo Hoo! 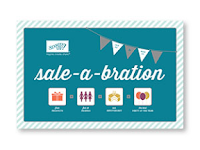 For every $50 you spend you can choose an item out of the Sale-a-Bration brochure for FREE or gather some friends and we'll make a couple cute projects and you can earn FREE items that way too! Contact me if you'd like to set up a time for us to stamp together. In honor of this FABULOUS promotion kicking off today I thought it only fitting to have my project show off some of the items you can earn for free! This card highlights the Pretty Petites stamp set and the coordinating punch Petite Curly Label. LOVE em' both! If you would like a copy of the Sale-A-Bration brochure and the Spring Mini Catalog, contact me and I'll send them your way! Happy Stamping!